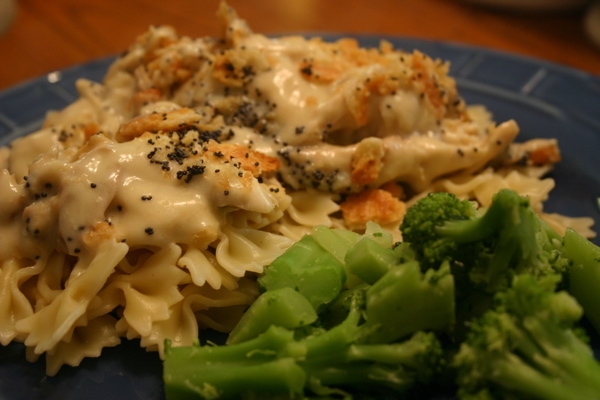 I love serving this chicken over egg noodles but really any pasta would be great. If you don’t want to serve it over pasta just decrease the soup to one can and it is an excellent stand alone casserole. I personally like it a little more saucy so I can have the yumminess with some noodles. We normally round out the meal with a green vegetable (which ever one the boys are eating at the moment) and cooked carrots. I have served this meal to clients who want a “home-cooked” dinner for traveling meeting attenders and they are always content at the end of the meal. I have heard how “homey and inviting” the food tastes. So no matter who you are cooking for, I guarantee this dish will be a winner. If you want to make it more fancy just adjust your sides accordingly. I have never had any complaints regardless of what is served beside this delicious casserole. Boil chicken with celery, carrot and onion. Shred chicken and discard bones and skin. (If not using chicken already cooked.) Spread chicken in the bottom on a 9 by 13 casserole dish. Combine soups, sour cream, and broth in a bowl. Spread soup mixture over chicken. Break Ritz crackers into large pieces over soup mixture. Pour melted butter over top of crackers. Sprinkle with poppy seeds. Bake for 30 minutes at 350 degrees. 8 Comments on "Poppy Seed Chicken"
Dinah! I made this dish for my family last night and it was so delicious! 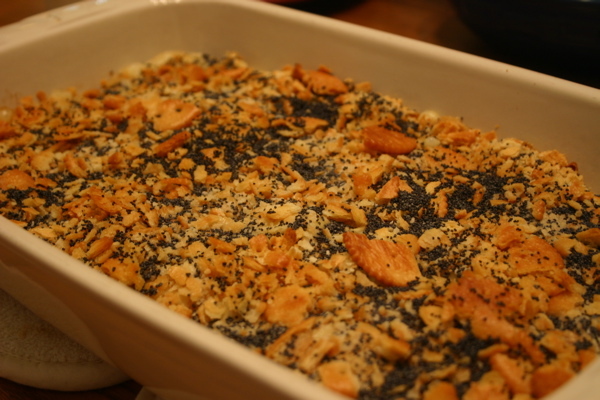 I love the creaminess of the chicken mixture with the crunchy of the poppy seeds and crackers! Sooo good! My kids even willingly ate this, even when they thought that I had covered it in “puppy seeds”. Haha! I really love this site! Often times, I want to cook something different for supper, that I know will be good, and yet simple. This site has really helped me do just that! You and Jeff are doing a great job! Please continue! I love checking the site to see what you’ve been cooking, and what I could possibly be cooking. The photos are also quite good and very helpful. This site obviously takes a lot of hard work, and it shows. Thanks for helping take the guess work out of what I should cook. Allie, I am so glad you liked the chicken. It is one of our favorites. I love “puppy seeds”. Sooooo cute. Thank you for such sweet words about the site. Yes it is lots of work but I am truly enjoying it. I love this recipe. We’ve done it quite a few times, and we love it! 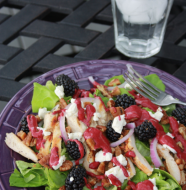 I always am looking for recipes to use with wild game as well, and this works really well with pheasant…in case you have followers who have the same need. 🙂 I love your site! Loved it! Even my almost 3 year old ate it, with some convincing, and ate it up! 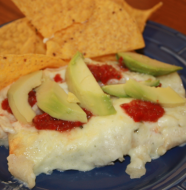 I remember trying a similar recipe years ago, but had forgotten all about it. Thanks! 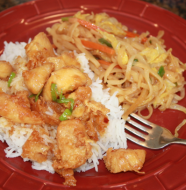 I love this recipe and have used it many times with a layer of cooked rice on the bottom of a sprayed casserole dish with the chicken on top. I bake it until it is heated through, about 25 – 30 minutes. It is a wonderful dish for potlucks or a meal for another family. (Have used some almonds on top and watched that they don’t get overly browned.) Your recipes are wonderful. Thank you. Great dish! I can’t wait to use the cream/soup mixture with other meats. Next time I’m going to try bone in pork. Love your blog! I love the option of putting almonds on top. Sounds delicious. Thanks for sharing.